Tall Pines Day Camp in Williamstown is a popular summer hot spot, where campers and staff just keep coming back. Parents feel safe and secure leaving their children at Tall Pines, knowing that they will play, learn, laugh and make lifelong friendships and memories. The family-oriented camp, now in its 18th season, is home to 600 campers between the ages of 3 and 14, who enjoy a multitude of activities throughout 66 spacious acres. Over 80 percent of the kids return every year, a figure that far exceeds the 50 percent national average. The loyal staff—some 300 seasoned professionals—keeps coming back, too. “Most of my staff grows up here, and if the staff is happy, they in turn make the kids happy,” points out Andrew Yankowitz, co-owner and director of Tall Pines Day Camp. “The campers are getting returning veterans who have grown up here.” In fact, most CIT’s (counselors in training) have been campers for an average of seven years before becoming counselors. Two-thirds of the staff are former campers. The Adler family, from Cherry Hill, began sending their sons to Tall Pines the very first year it opened, intrigued by what the camp had to offer. “It offered some different programming and we just wanted to take a chance and try it,” recalls Shelley Adler. “We were impressed when we went to an open house.” At the time, two of her kids, ages 7 and 5, attended and loved their experience. Two more sons followed in their brothers’ footsteps, and 18 years later, one of them is still a Tall Pines staff member. 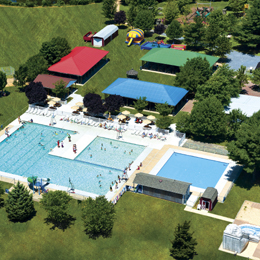 Because ga-ga is a favorite for many campers, two more ga-ga courts are being covered this off-season to accommodate rainy and sweltering days. Each year, new features are added and venues are renovated. The camp takes great pride in keeping up with new trends and expanding popular programs. Also for next season, swimmers will enjoy a newly expanded pool deck. Other recent additions include a brand new Xbox Kinect room with ten 32-inch monitors and a 65-foot long inflatable obstacle course. Kids will love the brand new high-end pingpong tables, while hockey fans will enjoy the freshly painted hockey rink. For kids more into the arts, Tall Pines offers many excellent programs in the creative and performing arts. Tall Pines has partnered with The School of Rock in Cherry Hill to offer guitar, drum, keyboard and vocal lessons. The program sold out in its’ first season. For budding actors and actresses, the theater program creates a large-scale production with professional direction to help campers hone their skills. Activities including dance, music, dramatics and singing, introduce kids to new skills. Wood shop, jewelry-making, cartooning and creative crafts, provide enjoyable unique artistic outlets. Kids with an interest in science and nature are encouraged to explore the camp’s dynamic environment. Carefully guided nature activities include fishing and the popular ropes/challenge course. Kids learn about environmental conservation through their exploration of nature. Owner and executive director Marvin Domsky brings 59 years of experience and knowledge as owner and director of Willow Grove Summer Day Camp. Yankowitz also enjoyed a 15-year career at Willow Grove and has been director of Tall Pines since it opened in 1996. Roughly 75 percent of senior counselors are state-certified teachers and education majors.